The book explores the societal influences that lead to the externally oriented, idealized, and ultimately self-defeating concept of the individual. It provides the structure and practical applications for clinicians to help their clients overcome struggles with externally oriented behaviors and discover an internal sense of satisfaction and peace of mind. 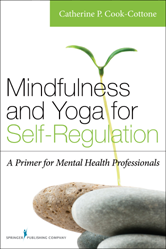 Tapping into the concept of a "hungry self" within the context of consumerism, the book advocates mindfulness and yoga approaches as alternate pathways toward a contented, regulated, and authentic experience of self. It addresses various aspects of the consumptive self and defines related syndromes such as disordered eating, compulsive shopping, substance use, and gambling. Loss of the Embodied Self: What Puts Someone at Risk? A Third Wave or New Paradigm?